PRODUCT DETAILS : Style : Semi Stitched Designer Wedding Wear&.. PRODUCT DETAILS : Style : Semi Stitched Diwali Speci..
Bollywood Replica-Sonam Kapoor Designer Bhagalpuri Silk Blue Diwali Special Lehenga Choli - 5544-B .. 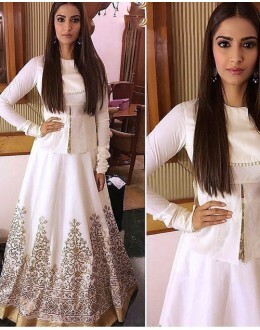 PRODUCT DETAILS : Style : Semi Stitched Bo..
Bollywood Replica - Sonam Kapoor Pure Net Red Lehenga - GC-8065 (IB-645) Product De..
Bollywood Replica - Sonam Kapoor in Designer Off White Golden Color Lehenga - 228 (OM-VOL-5) &nbs..